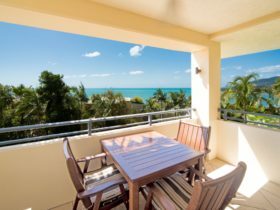 Tucked away in the hills of the Whitsunday mainland, Jubilee Pocket is just two minutes drive from the tourist haven of Airlie Beach on the road to Shute Harbour. 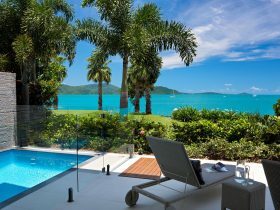 Jubilee Pocket’s relaxed ambience and proximity to the tropical, seaside town of Airlie Beach has made it popular in recent years with sea-changers. A short drive through the area and it’s not hard to see why. The township is nestled amongst rainforest and picturesque countryside. Nature walks, jet-ski hire and other water activities are close at hand. 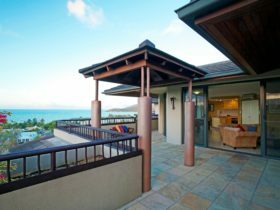 The warm, tropical climate at Jubilee Pocket means that winters are very mild and water activities occur all year round. 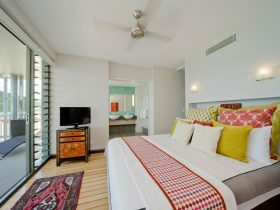 Two minutes drive west will find you amidst the hustle and bustle of popular Airlie Beach. 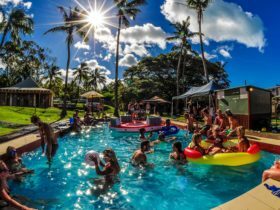 With its wide range of restaurants and bars, vibrant nightlife, tourist services and boutique shopping, Airlie Beach is a hive of energy set in a tropical paradise. Jubilee Pocket is a suburb of Airlie Beach - Cannonvale in Queensland. It is located approximately 912kms from the capital Brisbane covering an area of 3.959 square kilometres. Jubilee Pocket has a recorded population of 1817 residents and is within the Australian Eastern Standard Time zone Australia/Brisbane. If you are planning a visit to Jubilee Pocket we’ve put together some of the things nearby that you can see or do while you are here. These include, places to stay, tours and attractions, some upcoming events and places where you can grab a meal. Go ahead, try one of the buttons above. Every destination has something worth seeing so start exploring… If you know Jubilee Pocket and think we’ve missed something, let us know and we’ll share it here.